Seen on board the space shuttle Challenger, astronaut Sally Ride became the first U.S. woman in space on June 18, 1983. Sally Ride, the United States' first woman in space, who flew 35 years today (June 18), in 1983, has inspired countless people, as she lived a life committed to science, education and inclusion. And while she only "came out" publicly as a member of the LGBTQ community in her obituary, written by Tam O'Shaughnessy, Ride's surviving partner of 27 years, Ride is still the first and only acknowledged LGBTQ astronaut. Today, Ride's legacy and life story continue to inspire, as she has set a leading example, conquering what before seemed truly impossible. Astronaut Sally Ride at the CapCom console during STS-2 simulation. When Ride was selected as an astronaut, it was the first time that NASA had allowed women to apply. But while "our country was trying to do better by women's rights" by finally including women, O'Shaughnessy told Space.com, "the world wasn't ready yet," she said in reference to Ride's hidden sexuality. O'Shaughnessy spoke openly with Space.com about the obstacles that Ride faced, stating that Ride "didn't want to hurt NASA" by publicly coming out. But Ride's challenges with her sexuality didn't end with her professional status. O'Shaughnessy said Ride struggled internally with accepting her own sexuality. "When Sally was at NASA, she was a young person still figuring herself out," O'Shaughnessy said, adding that "she was married to Steve Hawley, a fellow astronaut." Tam O’Shaughnessy and Sally Ride enjoying a day out while traveling in Australia. In Ride's last days, while she was battling pancreatic cancer, she left the decision to make her sexuality public up to O'Shaughnessy. And while O'Shaughnessy said the decision to disclose their romantic partnership in Ride's obituary was difficult for her, she said that doing so "was amazing … it was just so freeing." In 2013, after Ride's death in 2012, President Barack Obama decided to give Ride the Presidential Medal of Freedom. He asked O'Shaughnessy to accept the medal on behalf of Ride as her life partner, which "was surreal," O'Shaughnessy said. She added that the experience and acknowledgement of their relationship was "my national coming out, and Sally's too." O'Shaughnessy said she only wishes Ride "could experience it with me." Tam O’Shaughnessy and Sally Ride pictured here together, were romantic partners for 27 years up until Sally’s death in 2012. Today, the impact of Ride's work extends far beyond her time in space. In 2001, Ride founded Sally Ride Science alongside O'Shaughnessy and a small group of their colleagues. The company, now a nonprofit organization, works to promote science, technology, engineering and math (STEM) literacy and diversity in STEM. "The largest part of her [Ride's] life was devoted to equal and excellent STEM education," O'Shaughnessy said. The organization continues in Ride's name to inspire young people of all backgrounds. As described by O'Shaughnessy, Ride was a nurturing person both in her personal and professional life. She supported all of the women who followed in her footsteps at NASA, "involving them in decision-making and kind of mentoring them." "She was true to herself, she followed her heart, she worked hard." O'Shaughnessy said of Ride. Tam O’Shaughnessy and Sally Ride, while partners in adulthood, had been close friends since they played tennis together as young girls. Here they can be seen together in Australia. In addition to creating Sally Ride Science to get young people excited about STEM fields, Ride continues, even after death, to be a role model. And "having role models that are visible in our society and around the world is just, it's priceless," O'Shaughnessy said. O'Shaughnessy discussed the unfortunate truth that there are too few women and people of color represented in STEM fields, and those in STEM continue to face harassment and discouragement. Still, for many, Ride was the role model that showed them that they, too, could achieve greatness; her achievements made their dreams possible. Ride even famously said, "You can't be what you can't see," which speaks to the power of representation, said Sarah McBride, the national press secretary for the Human Rights Campaign. Ride "demonstrated to the world that LGBTQ people can be astronauts, that we can be part of every single field and industry, and that we can do incredible things in those jobs," McBride told Space.com. With more representation of people from diverse backgrounds, young people will be "living their truth and dreaming big dreams all at the same time," McBride said. Today, our society is considerably different from what it was when Ride became an astronaut. Ride would be amazed by how far we've come, "especially if you disregard the last year and a half," O'Shaughnessy joked. When asked if they think that there will ever be an openly LGBT astronaut, O'Shaughnessy responded, "absolutely," and McBride told Space.com that "it is only a matter of time." While O'Shaughnessy noted that change, especially large social changes like advancements in civil rights and women's rights, happens slowly, she added that "our society is becoming more tolerant." And the "percentage of people that identify in various ways is going to increase" as a result of increasing acceptance and representation, she said. 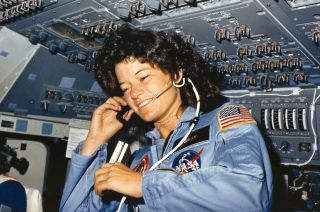 "We all need role models," O'Shaughnessy said of her late partner, and Sally Ride remains one of the best. Tam O’Shaughnessy and Sally Ride sharing a tender moment with their bichon pup named Gypsy.